Royals hold off Toombs County. 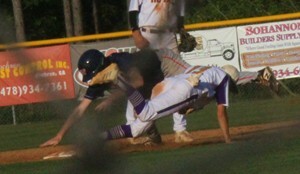 Carson Waters tags out a Bulldog player before he can reach second base. It was a matchup of former region rivals as BCHS hosted Toombs County Thursday afternoon. The Royals were faced with not looking past the Bulldogs while preparing for tomorrow�s potential region-clinching showdown against Washington County. Andrew Thompson caught this pop foul. An RBI single by Lane Kitchens in the second and RBI groundout by Tripp Purser in the third made it 4-0. Kitchens added another RBI single in the fifth. Toombs got a pair of runs in the sixth. On in relief in the seventh, Kitchens worked out of a two on, one out jam by striking out the side as Bleckley won 5-2. He was 2 for 4 with 2 RBI. Matthew Bland leaps to pull in a catch. Steven Knighton went 1 for 2. BCHS hosts Washington County tomorrow. Senior night recognition will take place at 5:35 pm, the game to follow. If the Royals win, they clinch the 3-AA title.